"M&K Reef was named as Michael and Kelly had their wedding reception straight on-shore from here"
We start the day by packing up our camp and driving the short distance into Tibooburra. We fill up with petrol again as we are leaving for Innaminka in South Australia straight away. I phone Les and find out that his front left diff was stuffed and that it will not be fixed till Thursday afternoon. The others are going to leave Bourke today and go to Tibooburra and then tomorrow onto Innamincka. 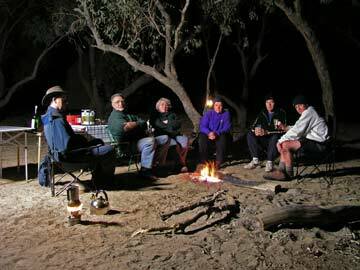 I tell Les that they can meet us at the Cullyamurra Waterhole or Innaminka tomorrow afternoon. 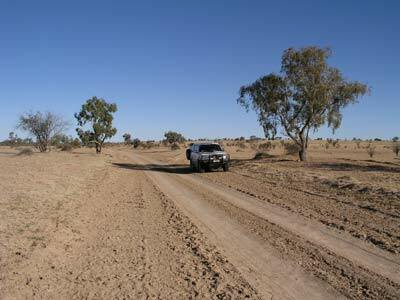 Les will leave Bourke on Friday morning and go straight to Birdsville, taking two days to get there. 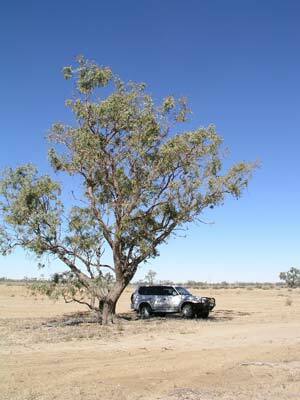 Therefore, we now have to wait a day somewhere on the way (that is either three days in Innamincka or Birdsville). I tell Les to leave a message on my home phone when he knows when he is leaving Bourke and I will get the message from Innaminka. South Australia is to the right, New South Wales is behind us and Queensland is on left The Yellow Bus! 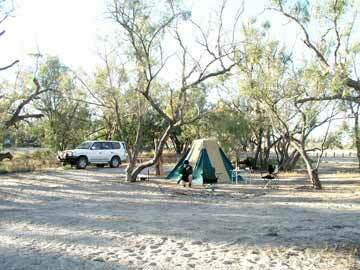 We head west out to Fort Grey and have morning tea at the camping ground. Fort Grey Lake is totally empty. On my trips in 1977, 1980 and 1981 the lake had varying amounts of water, all left over from the 1974 floods. 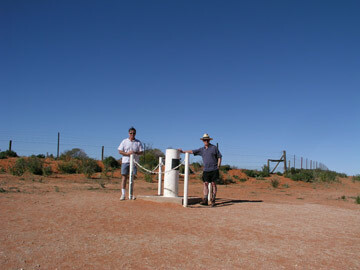 We then drive the short distance to Cameron Corner which is where New South Wales, Queensland and South Australia meet. It is interesting that back then it was always called Camerons Corner. There are heaps of people here, one large bus, one large 4WD and other 4WDs. 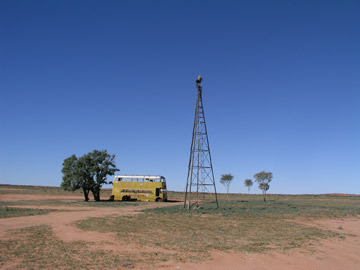 The bus and many of the 4WDs are also going to Innamincka. We head west and stop at the Yellow Bus. This is an old South Australia double decker bus abandoned out here in the desert. God only knows how it got here! From here we go to Merty Merty but you do not see the homestead as it is well set back off the road. We decide to take the Old Strzelecki Track which basically follows the Strzelecki Creek. It is in good condition and I cannot understand why it may have been closed as there is no evidence of water. We stop for lunch just past here and the bus passes us. There are many oil fields along here, with single oil rigs pumping up and down, just like you see in movies set in Texas. We catch up with the bus at the Moomba Road as they have stopped for lunch. We decide to stay on the Old Track again. This is very rough for the first 20 kilometres, only 30 to 40 kmh but then it gets better. 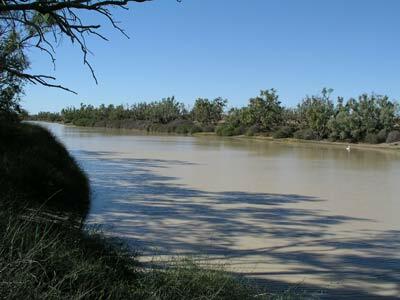 We arrive in Innamincka and look at the Town Common Camping Area (on the Cooper Creek) but then go straight to Cullyamurra Waterhole as it is getting late and we want to pick a nice spot as we will be staying three nights. We also need to pick a spot that is suitable for three vehicles for when the others arrive. 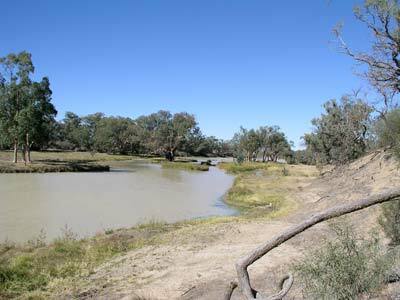 This waterhole is very nice, lots of corellas, kites, pelicans and other birds. The waterhole is about 11 kilometres long and is about 100 or more metres across. It is reputedly 30 metres deep. We pick a spot right by water (as nearly all the spots are), about a quarter of the way into the camping area (it is about 8 kilometres long). We have a hot shower using a full 10 litres each (luxury). After this we have some beers, collect some firewood (very little around so make sure you bring your own) and make a fire to cook dinner. We have a lamb roast and baked potatoes, carrots and pumpkin. This is the first time I have used the camp oven. It takes about 35 minutes to cook a small roast, the same for potatoes and pumpkin but the carrots were burnt, they needed only 15 minutes. The coals from the small mulga wood fire last all night and still have a glow in the morning. Fantastic firewood. Maximum temperature today about 23C. A volunteer National Parks and Wildlife Service (South Australia of course) guide leads us on a walk to some Aboriginal engravings in the morning. It is about a 30 minute walk. There are a lot of granite rocks covered in iron oxide. These have very strange engravings, figures, boomerangs etc unlike any I have seen before. There are not many people on the walk, only four others. We then drive to the Wills Grave site. This is where the ill-fated Burke and Wills Expedition of 1860-61 ended in disaster. This is the original grave of William John Wills (his body was later collected and taken to Melbourne). He died in late April or early May 1861 and was buried by John King, the only survivor of the party that set out from Cooper Creek (or Cooper's Creek as it is referred to in the official report of the expedition) for the Gulf of Carpentaria. We then go to Kings Site which is where King was found by the rescue party (he lived with the local Aboriginals for over four months). 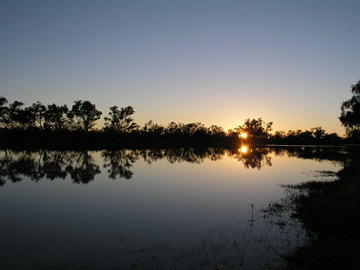 We also drive to Minkie Waterhole, a great alternative to the Cullyamurra Waterhole and with some very good camping sites. These are all on the Cooper Creek and large waterholes. Minkie is small but particularly nice. We have lunch there. 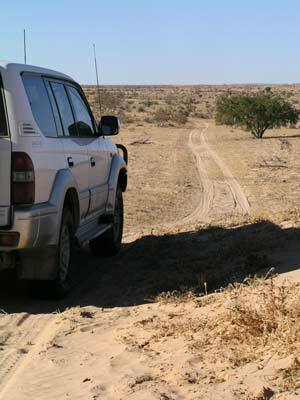 Then we go back to town and off on the track to Coongie Lakes. 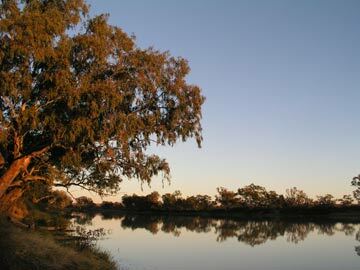 Coongie Lakes is said to be fantastic but I had never heard of it before I got to Innamincka. We are not going there, but just along a section of the track till we reach the Duranti Track. We take this back to town. This crosses a number of sand dunes and salt flats and is quite interesting. Along the Durantie Track I call on the radio to see if the others are close by. Robby and Irmgard answer me. They are about 10 km south of town (we are about the same north-west). We arrive in town as they pull up outside the pub. We go in and have a few middies of Coopers Pale Ale (draught!). 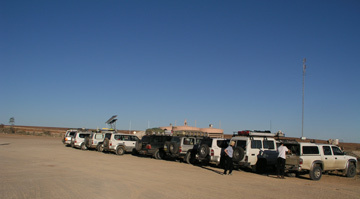 After the refreshments we take them out to Cullyamurra Waterhole and set up camp. Frank and I again have hot showers. We have chicken winglets, sausages, damper (cooked in camp oven) and vegetables. Another small but very good fire. Frank and I get up early in the morning as we want to take some photographs of the sunrise. We had worked out the previous morning the shots we want to take so we do not need to go searching for nice subjects. We spend some time getting the shots we have planned. After breakfast the others go on a bush walk to the Aboriginal carvings while we just lazed around. When they come back we have morning tea. 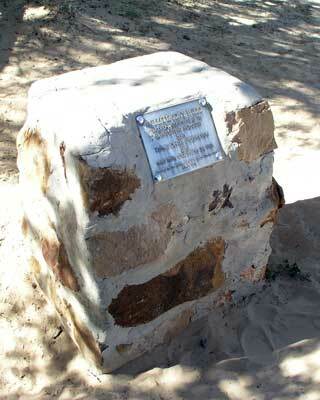 After morning tea we first go to Burke's Grave which is at the start of the Cullyamurra Waterhole. This is where Burke was originally buried before he was exhumed and taken back to Melbourne. From here we take the southern route to the upper reaches of the Cooper Creek. This is in Queensland. The Cooper here is wide and deep and a permanent waterhole. 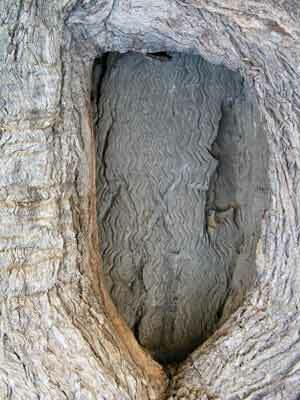 This is the site of the famous Dig Tree. When the main body of the Burke and Wills expedition gave up that Burke, Wills, King and Gray would never return from their expedition to the Gulf, they buried a load of food and papers in the ground and wrote on the tree to "Dig 20 yards west". This was so the local Aboriginals would not find where they had buried the items. As an aside, in a tragic decision, after waiting months longer than they were supposed to, the party left the morning that Burke, Wills and King returned. They were too exhausted to set off after the main party and months later only King was found alive, looked after by the Aborigines. We arrive there and have lunch. It costs $11 to enter per vehicle (it is private property - should be a national park due to the historic and natural features) and this includes camping and timber for fires. We then look at the trees. You can only see part of the B LXV carving on the water side (this is the camp number - 65). The main carving on the other side is now covered by bark. Apparently someone is going to use ultrasound to check the carvings soon (not sure if this ever happened as I have never seen anything about the results in the media). We decide to return to Innamincka via the road north to the Innamincka Flood Bypass Road. This has very spectacular scenery, with St Annes Range and then to the south Table Mountain. There are lots of mesas and jumpups. Back in Innamincka we fill up with fuel and I phone Les. He does not answer so I ring home and get his message that he left Bourke yesterday and should be in Birdsville tomorrow night or Sunday morning. After refuelling, Robby, Frank and I go to an Aboriginal tool site behind the town garbage dump. We find some stone tools there. We head back to the pub for a beer while some have showers in the free public toilet/shower block outside the hotel. Frank and I go back to the camp where we have a shower (as much as we want - using the water from the waterhole - brown but clean). We have pasta for dinner. As everyone is going to bed so early, I have got into the habit of going for a walk before I go to bed. This week has had a very good moon and it is easy to walk along the tracks. Tonight I walk to the end of the camping area and back, about four kilometres or so.